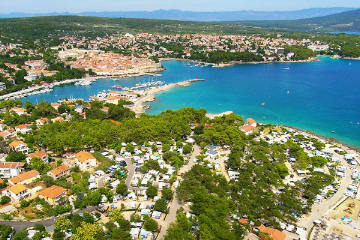 This page provides information on camping facilities on the island of Krk. 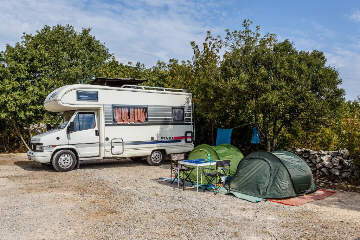 All prices, where given, are approximate, as supplied by each camp site and are based on a high season booking for two adults, one tent, one car, electricity connection and tourist and eco tax. Please note that we do not take camp pitch bookings on this web site. For further enquiries please contact the relevant camp site directly. 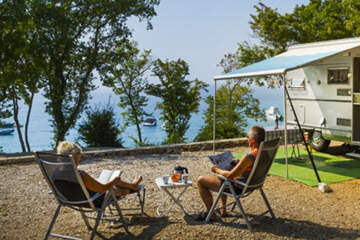 As an alternative to a camping holiday, why not check our list of over two hundred apartments on Krk, a selection of beachfront mobile homes located within Island of Krk campsites or our range of other Krk accommodation on offer? 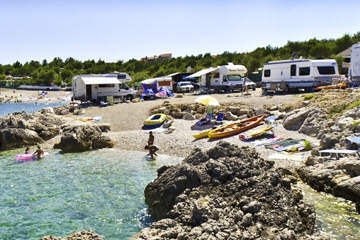 This camping site is situated on a peninsula, only minutes of easy stroll from the Krk town centre. This is a fairly large camping site with over 600 pitches. Sporting facilities: Two tennis courts, mini golf, table tennis, bowls, water sports, diving centre. 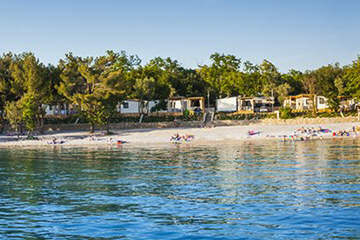 "Camping Resort Krk" is located on the wooded peninsula Prniba, close to the centre of City of Krk. 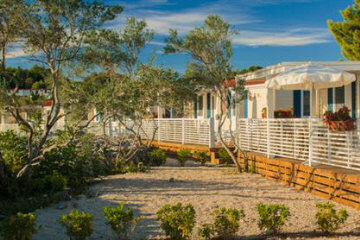 This luxury eco-camp has 360+ pitches and over 120 mobile homes for hire. Note that this is not a naturist campsite any more. 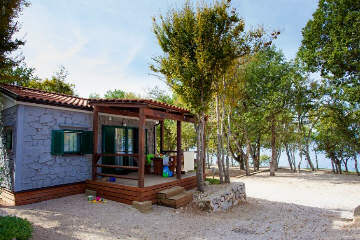 The campsite Glavotok is situated on the western part of the Island of Krk, in a wooded area adjacent to the sea, about half way between Malinska and City of Krk (approx. 15 km to each). 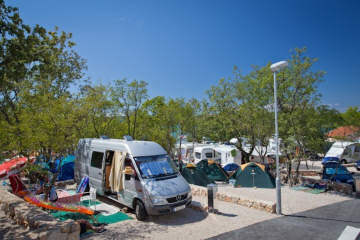 The camp is popular with guests who want to be close to the nature, away from busy tourist towns. 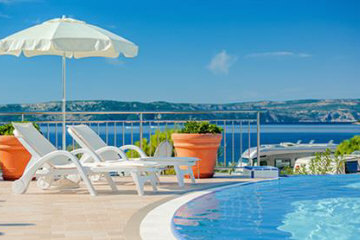 Located on the outskirts of Krk Town, Ulika is private gated complex of two mobile homes adjacent to the stone built house. Stone house hosts a modern kitchen and a living area and mobile homes each have two bedrooms and a bathroom. 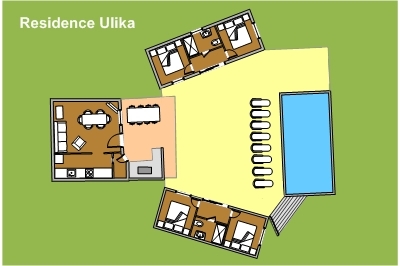 Residence Ulika is being rented as a single private holiday accommodation and it can accommodate 8 people. 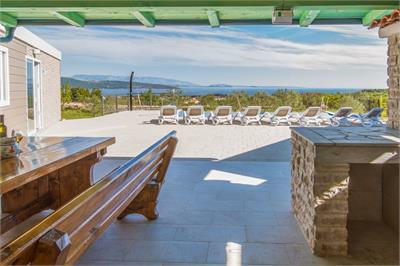 Camp Skrila is located 1 km from Stara Baska village on the southern side of Krk Island and aproximately 6 km from Punat, in the part of Krk that has some of most beautiful beaches. Although this camp is not a naturist camp, it has one of beaches dedicated to naturist swimming and sunbathing. The capacity of the camp is 999 people. 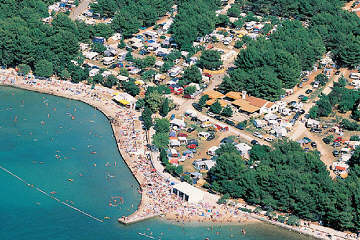 Camp Bor is situated in a pine forest near City of Krk, approximately 500 metres from the shore. 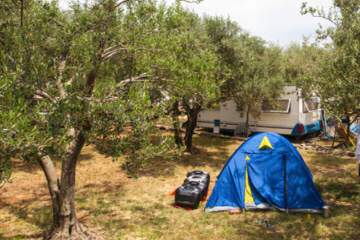 Camp Pila is positioned in the shade of fir trees on the outskirts of town of Punat. The centre of Punat is only 5 minutes of walking distance from the camp. 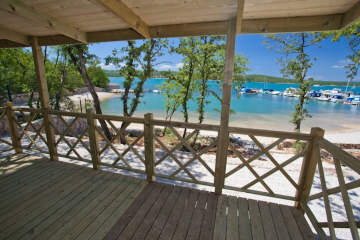 Camp Konobe is a naturist camp and is situated in the sheltered bay only 3 km from Punat town centre. 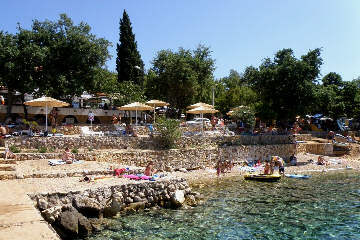 The Zablace Camp is located in Baska, next to the 1,800-meter-long Baska beach. The first section of the Camp is located on the beach whilst the second section of the Camp is located at a distance of about 100 meters from the sea. The camp guests have usage of swimming pool and fitness studio in Wellness Centre of the nearby hotel. 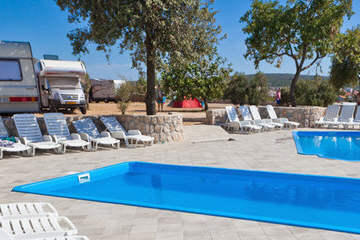 The four star campsite on the Krk Island, naturist camp Bunculuka is located near Baska. 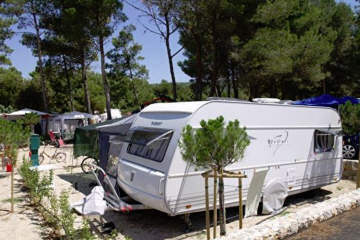 The peculiarity of the camp are terraced plots surrounded by pine woods. The camp has 400 camp units and can accommodate 1200 guests. Small camp near Baska of about 20 parcels. 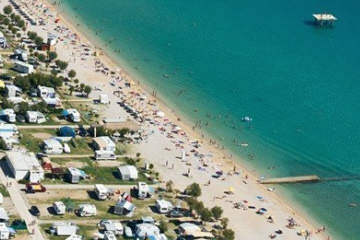 The camp is positioned 30 metres from the beach. Facilities: Children playground, sanitary facilities, most parcels equipped with grill. 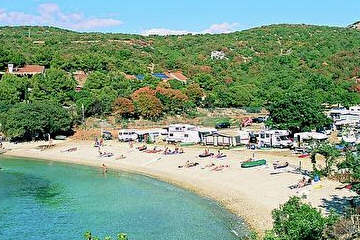 This mini campsite is located near Klimno on the north eastern side of Krk Island, next to the lovely pebbly bech. 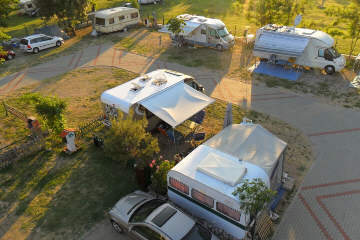 The four star campsite is oriented to families and has 60 parcels and 6 mobile homes. 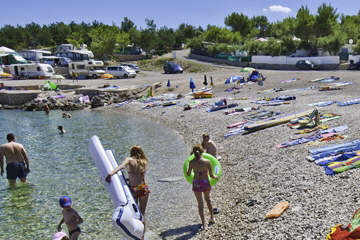 The camp is located 500 metres from Silo on the north eastern side of Krk Island. Camp has shaded areas underneath mature pine trees. Every camping plot has a sea view. Sporting Facilities: Tennis courts on camp grounds. Football pitch and basketball court nearby. 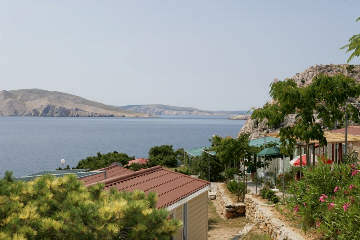 The camp is located only 400 metres from Njivice town centre, on the western side of Krk Island. The camp can accommodate 2000 persons on 600 pitches. 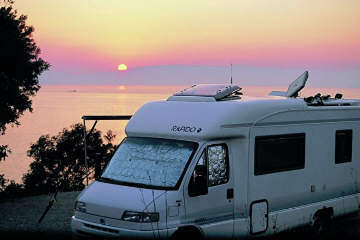 Camping Marta is a small family campsite, only 1.5 km from the beautiful pebbly and well equipped beach Jert which also features a free parking. 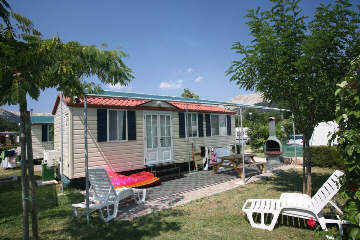 Camping plots are situated in the shade of mature vine and fig trees. 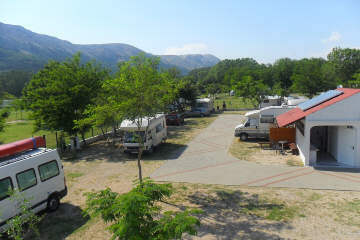 The campsite accommodates 50 guests. 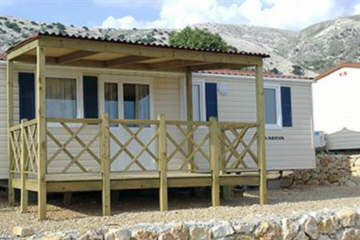 Facilities: Newly restored sanitary facilities, electricity connection, free use of fridge, Wi-Fi internet, covered area with a barbecue. 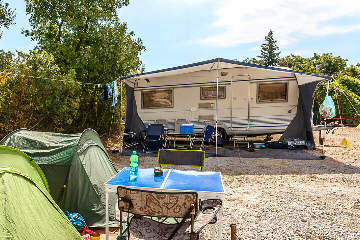 Web pages of Croatian Camping Union provide the list of all Croatian campsites as well as give the further information on Croatia camping.